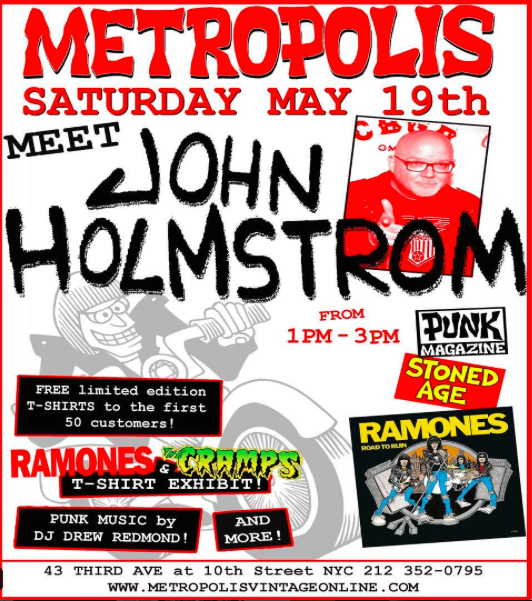 East Village resident John Holmstrom, the co-founder, editor and illustrator of Punk Magazine, will be at vintage-clothing outpost Metropolis tomorrow signing copies of his new publication (zine! ), Stoned Age. Stoned Age "intends to bring back the fun of 20th century marijuana culture, when it was the choice of hipsters, beatniks, jazz musicians, hippies, and other misfits," per tomorrow's invite. 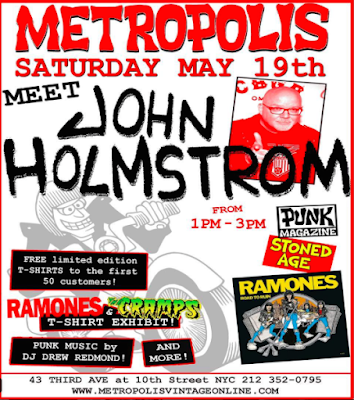 Holmstrom, who illustrated the covers of the Ramones albums "Rocket to Russia" and "Road to Ruin," will be in the store from 1-3 p.m., though there are activities happening all day at Metropolis, including DJ Drew Redmond "spinning old-school punk." Metropolis is at 43 Third Ave. between Ninth Street and 10th Street.